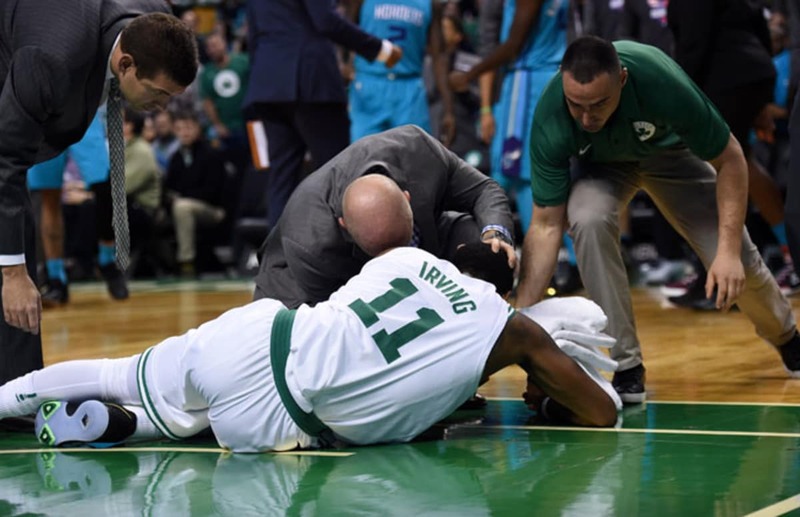 The Boston Celtics� playoff chances took its second major blow of the season when the team announced Kyrie Irving needs an additional procedure on his surgically repaired left knee and will miss the rest of the season. The surgery is expected to be performed by doctors on Saturday and will force the All-Star point guard to rest for the next four to five months. News of Irving�s absence for the rest of the season and the playoffs sent Boston�s odds for the postseason plunging. The Westgate Las Vegas SuperBook tweeted that the team�s odds to win the Eastern Conference went from 9/2 to 20/1. The odds for winning the NBA Finals dropped even worse. They went from 20/1 to 80/1. It is the second devastating injury to the Celtics this season. In the first game of the season forward Gordon Hayward landed awkwardly on his left leg and broke his tibia and ankle. The former Cleveland Cavalier had come to Boston in a trade demanded by Irving over the summer of 2017. He had grown tired of being second fiddle to LeBron James and with the Celtics he had the opportunity to be the team�s superstar. He relished the role and led the Celtics on a 16-game winning streak early in the season. The team had opened at 15/1 to win the NBA Championship, and suddenly dropped to 10/1. The team took over the No. 1 seed in the Eastern Conference and held it until February when a surging Toronto took over the top spot. Still Boston was pegged as the best team in the East. Irving wasn�t sure what to expect when he had surgery on March 24th to remove a tension wire in the knee that he fractured in the 2015 NBA Finals. That procedure was a success, but it was during the operation that they found a bacterial infection at the site of the two screws that were implanted in the knee during the initial surgery. The decision was made to keep the 26 year old out of the lineup for the rest of the season. Irving posted on his Instagram his disappointment. The recovery time is expected to be four to five months and he should be ready at the beginning of next season. That doesn�t help the team now, however. Without him the Celtics will likely struggle to get out of the first round of the playoffs. Their first-round opponent will either be Washington or Milwaukee and each team gave Boston a preview of what to expect. Irving was not in the lineup on March 14 when the Wizards traveled to Boston and won, 125-124. The Celtics went on the road to play the Bucks on Tuesday and lost 106-102. They were favorites in both games, but will be in the underdog role once the playoffs begin in a little more than a week.